This entry was posted in Codes, Pacific, WWII and tagged Christian Slater, Infantry Combat, Movies, Navajo code talkers, Nicolas Cage, Pacific, War Movies, WWII. Totally agree. I could not get past ten minutes. Absolutely ridiculous. Also shamefully inaccurate in its main plot point – the guardian will have to murder his Indian if he is in danger of being captured. Bull crap! Crap and disappointing. I have a problem with Nicolas Cage. He did good things but when he’s not convincing, then he is really awful. Choctaw indians were also successfully used as codetalkers in the AEF during the Meuse-Argonne Campaign at the end of World War I. It was an identical scenario where the Germans had cracked American codes and also were listening in to both wireless and telephone transmissions. The Germans couldn’t decipher the Choctaw language. Unfortunately all Native American codetalkers were forgotten history until Windtalkers at least raised their profile from World War II. That’s very interesting… It’s true that not many know about their participation in WWII and probabaly even less about WWI. 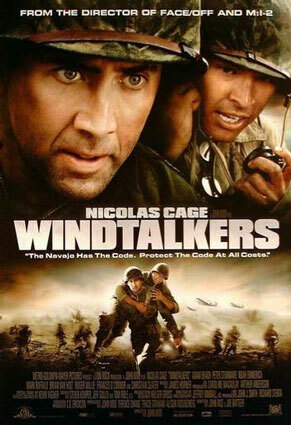 I was annoyed that they didn’t do a better job with Windtalkers. Such a worthy topic. Nicolas Cage did this movie a great disservice. The topic is still fascinating. I might have been very harsh but expected so much from this. Glad you enjoyed it. Yes, it wasn’t that accurate.